Dr. Shashank Agrawal is one of the best and a much liked Ayurveda doctor who has had an experience of about 5 years in his hands. With an excessively large number of more than 858 excellent reviews from his patients, he has garnered quite a huge amount of popularity. 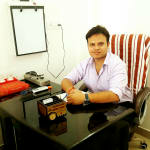 Dr. Shashank Agrawal proudly boasts of his medical degrees. He has a PG Diploma degree in Emergency Medicine Services (PGDEMS) from Ruby Hall Clinic from the year 2013. He possesses a Bachelor's degree in Ayurveda, Medicine and Surgery (BAMS) from Dr. D.Y. Patil Ayurvedic College and Research Center from the year 2014 and has also been awarded an MD-Internal Medicine doctorate degree in Acupressure Research Training and Treatment Institute, Jodhpur from the year 2014. He is currently in a professional association with National Integrated Medical Association. Presently, he is attending his patients in a few clinics in Uttar Pradesh, at consecutive timings. These clinics involve Pranacharya Arogyam at Pratap Vihar, Ghaziabad. The second one is Pranacharya Arogyam-Aligarh at Vijaygarh. Prior to this, he had worked as a general physician at Jiva Ayurveda and as a physician at Satara Civil Hospital. His specialties include asthma treatment, cosmetology, dermatology, infertility, gynecology, endocrinology, cardiology, Ayurveda, Panchakarma, pain management, health, thyroid, sexology and many more which is a never-ending list. The sole motive of Dr. Shashank Agrawal is to provide consummate service, fruitful results, valuable treatment, full satisfaction and proper insurance coverage to his patients. Dr. Shashank Agrawal provides answers that are inspiring, saved my life, caring, very helpful and prompt. Thank you so much doctor...now without and tension i can fulfill my aunt sexual desires. Finally with his treatment, I am completely cured from the disease. Shashank Agrawal has so much knowledge that for everything my family takes his reference. The overall atmosphere in the Pranacharya Arogyam - Ghaziabad is very soothing. I had lost hope, but the gastric problem treatment given by Shashank Agrawal has helped me regain my confidence. It was amazing, the Pranacharya Arogyam - Ghaziabadl was so nicely made. He is very patient with all his patients. The male sexual treatmnet given by Dr Shashank has helped me greatly and now I am perfectly fine. During the treatment, he supported me a lot. In the past i consulted so many doctors, but nobody was able to help me with my problem, but he has helped me immensely. He is well aware about innovative techniques to treat problems. Also He is very talented and seasoned doctor. In the past i consulted so many doctors, but nobody was able to help me with my male sexual problems , Atlast I consulted Dr Shashant who is a knowledgeable doctor in the field of Ayurveda, but he has helped me immensely.He is really like god send person. It was so quite pleasant in the Pranacharya clinic. Thanks to him I am much better now. I was in so much pain due to my erectile dysfunction. Dr Shashank Agarwal's treatment suited me the best and now I am fine. The nurses at the Pranacharya Arogyam - Ghaziabad were really helpful. He ensures that he listens to his patients. The guidance of Dr Shashank Agrawal gave me has helped me immensely with my situation. I was shocked to experience the problem of pimples. I am so much benefitted with his treatment, that i am perfectly fine now. The staff was very attentive to my needs. I searched Dr Shashank Agrawal online and saw his reviews. The interior of the Pranacharya Arogyam in Ghaziabad was no nicely done, it was so clean. It was a bad case I had issues of weight loss. I am so thankful that Dt.Shashank Agrawal has given me the best advice and I am now finally able to get back to my normal self. Even in case of long queues, the staff was managing people in a very positive manner. He did my weight loss treatment. dr Shashank Agrawal ensures that he gives enough time to each patient. Over the period of time the the treatment of acne and pimple that I received from him has helped me a lot. All the staff members at his clinic Pranacharya Arogyam in Ghaziabad were very helpful. I was in so much pain due to my allergy.With great ease dr Shashank Agrawal explained us the problem and how the allergy treatment will be carried out at his clinic Pranacharya Arogyam - Ghaziabad.Thanks to him I am totally satisfied with the results. Dr. Shashank Agrawal provides answers that are knowledgeable, caring and practical. That what you told is good for health, can cure my headache but what about the girl sir. I always thinks about sir. How can i remove it completely from my mind sir ? Dr. Shashank Agrawal provides answers that are caring, prompt, well-reasoned and knowledgeable. Thank you for your reply doctor. But the problem is that I can't make for workout. But I l focus on my diet. I found the answers provided by the Dr. Shashank Agrawal to be very helpful and knowledgeable. Ive consulted other doctors and im happy woth the doctors consultation. Thanks lybrate for the help ! Dr. Shashank Agrawal response is very good. He has answered to my every query. I am starting his treatment for 15 days as suggested. I am sure it will help without any side effects.